Gossip Gay Rappers Young Thug And Lil Uzi Vert Are Allegedly 'DATING' Each Other!! 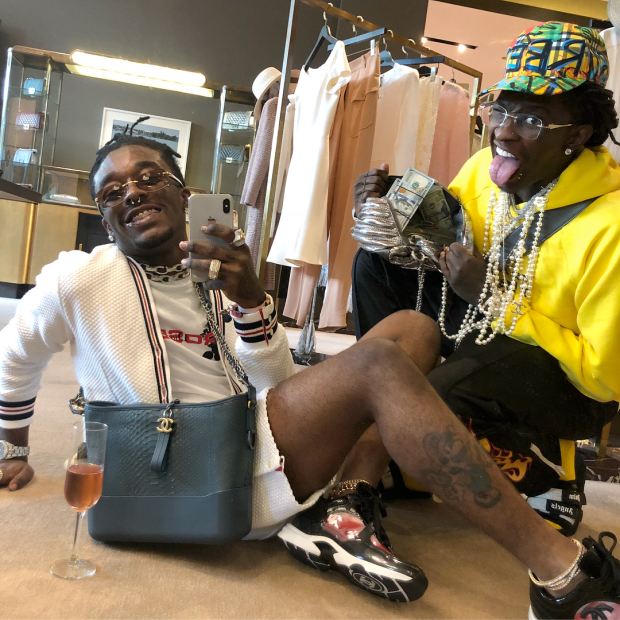 Gay Rappers Young Thug And Lil Uzi Vert Are Allegedly 'DATING' Each Other!! We just got a sip from the national tea that rapper Young thug and Lil Uzi are into some kind of funny relationship. The two gay rapper has been giving us couple goal and they've been spotted together on countless occasions which suggest to us that they do have a thing going on. Though no words had been heard whether they're officially dating but let's hear how MTONEWs are reporting the said story..
MTO News just received a BLOCKBUSTER report. According to a person close to Young Thug . . . he believes that the top selling Atlanta rapper is ACTUALLY DATING Lil Uzi. The two rappers have been "flirting" on social media for years - calling each other bae, and love. But most onlookers believed that he two men were just TROLLING THEIR FANS. Well according to a person close to Young Thug - he does NOT believe that it's all just jokes. The insider told MTO News, "If they were playing like that just for Instagram or Snap, then I'd think it was trolling. But those n*ggas act like they're together when there are no cameras around." The insider claims that the two rappers constantly text each other - up to 100 times a day. And they fly out to "see" each other a couple of times a month. The insider adds, "Who flies into town just to see his homie. Something don't seem right." But MTO News' insider admitted that he's never seen the two men kiss, or do anything else romantic. The insider told us, "I never saw them kiss. But a lot of times they're all alone. [Last month] they threw everyone out of their hotel room except them two. Even security and b*tches had to go." Reports also said, "In the comments section of the photo above, ATL Rapper 21 Savage decided to chime in and call the two gay." Imagine if the two rapper came out together .